Considering carrying extra ammunition for your Glock? The Glock has tons of options for mag holders. Having tons and tons of options is great, but presents its own problems. How do you separate the better Glock mag holders from the crappy ones? That’s the real question. It’s easy to find Glock mag holders, but it can be difficult to find good Glock mag holders. Today, we’re going to guide you through the process. We are going to name some of our favorites, but we are also going to give you the tools necessary to pick your own. This way you can walk away with the ability to choose the right type, brand, and style for you. Since the Glock series is easily the most popular striker-fired polymer pistol line in the world it should be understood that they’re carried for a variety of purposes. So, just like with holster selection. you have to choose a mag carrier that works for your Glock’s purpose. Why is it important to match purpose to a Glock mag holder? I think the best way to explain is to dive into the three main jobs the Glock does that would require additional magazines. Glock has tons of different full sized, compact, subcompact, and even three single stack models that are perfectly designed for concealed carry. Concealed means concealed, so you’ll need Glock mag holders that you can easily and comfortably hide in your everyday clothes. Some mag pouches are simply too wide and held too far off the body, making them difficult, if not impossible to conceal carry effectively. Fortunately, you also get have options to run your mag holder outside the waistband, inside the waistband, pocket, and combination holster and mag holders. Retention is an important consideration for concealed carry because the entire idea of concealed carry is based around self-defense. You’ll need a pouch that can keep your mags where they should be when living your everyday life, and when things start to get rough. Tactical applications like police and military work have their own special requirements. Tactical shooters aren’t concerned about concealing their weapons or their Glock mag holders, so they can use bigger and wider systems. Since tactical operations are often on the offensive, speed and retention are the main keys. 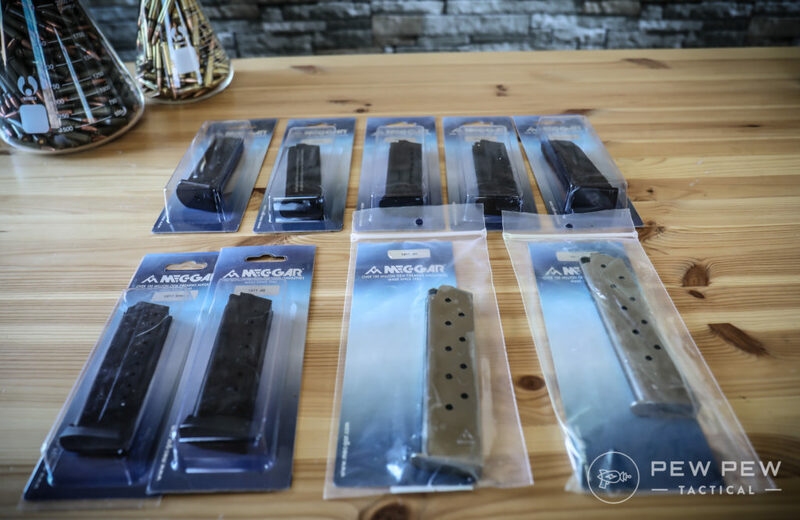 Tactical Glock shooters need to be able to rock, roll, and reload quick, fast and in a hurry, so their magazines can be placed further from the body to ensure easier and more intuitive grip when they are needed. Because their gear is often not concealed they also need to consider retention. In a close quarter fight, your gear is up for grabs. Tactical users may also be tasked with more extreme and dynamic movements than us normal folks. This could involve jumping, chasing, climbing, and even wrestling a suspect to the ground. With all this in mind, they may need to consider active retention devices to secure their Glock mags. On pistol magazine pouches these are most commonly flaps that go over the magazines and utilize a snap or button to secure it. For mounting on a plate carrier or tactical vest you may have a bungee cord that secures the magazines in place. An active retention device isn’t always necessary, friction retention is suitable if the magazine pouch is well made. Competition mag holders for Glock pistols are numerous since the Glock is a popular competition gun. What I mean by competition is action shooting sports like IDPA, IPSC, USPSA, 3 Gun, and more. What I’m not talking about is bull’s eye competition. 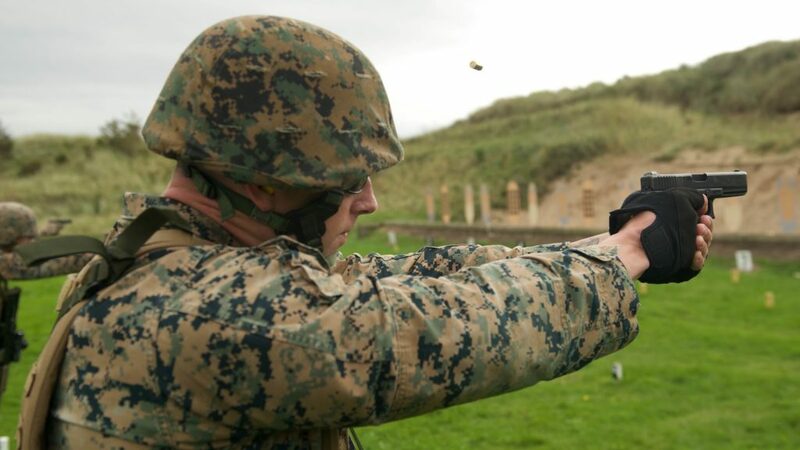 Competitions are won and lost by fractions of seconds in some cases, and reloading is a good way to get caught moving slow. Competition mag pouches need to present the magazines cleanly and make them easy to grip and rip. This means they present the majority of the magazine to be gripped, and the magazines are spaced far enough apart you can easily grab them. Comp Glock mag pouches still have the concerns of retention, but it’s not life or death. You don’t want your mags falling out, but unless the rules require active retention passive is the way to go. The choice between materials generally comes down to leather, polymer, and nylon (or other synthetic materials). Leather and polymer are generally the most popular options because of how well made both materials are. Leather is stiff, looks great and is a classic option for carrying guns, so why not mags? I like leather mostly for deep concealment, mainly because leather feels softer than polymer when shoved against the body. Most leather Glock mag holders are OWB style, and quality models from companies like Galco are guaranteed to be long-lasting. Polymers like Kydex and Boltaron have become superbly popular in the last few years. Unlike leather, they are weather and wear proof. They don’t soften, can be extremely thin, and can have both passive and active retention. Blue Force Gear makes one of the best single pistol mag pouches for belts. Most synthetic material based magazine pouches are suited for tactical gear and for adaption to MOLLE or PALS webbing. Two of Glock’s newest guns are the models 42 and 43. These are single stack pocket guns in 380 and 9mm respectively. While they are both small single stack pistols the differences in caliber does mean the magazines are different sizes, so a 42 magazine won’t fit in a Glock 43 mag holster, and vice versa. Glock also has the Glock 36, a single stack 45 ACP pistol with a wide single stack magazine, so remember this mag is going to require a specialized mag pouch. The most popular Glock pistols are those in medium caliber designs. This includes 9mm, 40 S&W, 357 SIG, and 45 GAP. These moderately sized double stack magazines are the easiest to find mag holders for. You’ll have no issues finding mag holders in any configuration in this category. Glock also makes a double stack 45 ACP and 10mm design that is substantially wider than your average double stack magazine. This requires them to have specialized large magazine holders, since they aren’t compatible with your standard double stack mag pouch. What’s Your Preferred Method of Carry? 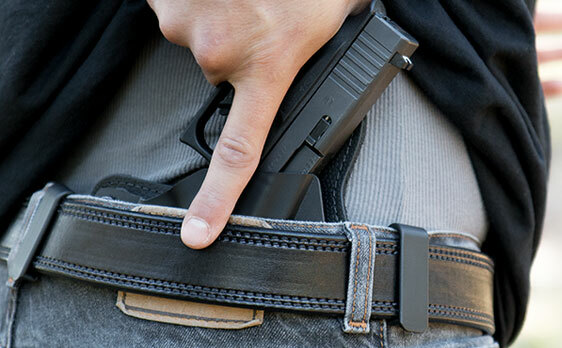 OWB – The most common Glock mag pouches are designed to be worn outside the waistband hooked to a belt. This is a very comfortable, and very easy to access method of carrying additional magazines. It does make concealed carry impossible if you have to tuck in your shirt. IWB – Inside the waistband allows you to carry a spare Glock mag in deep concealment, and certain designs even function with tucked shirts. Some may feel this method of carry is uncomfortable, but it’s the easiest way to conceal a spare mag. On Holster – Carrying a magazine on your actual holster is becoming a popular method to carry an extra mag or two. It’s nothing new, and holsters like the Galco Miami shoulder rig have long featured the ability to carry spare mags. Recently appendix carry holsters have been adding magazine carrying capability to their designs. This is a double edge sword for strong side carry. For appendix and shoulder it works well because it places the magazines in the range of the off hand. There are some tactical option that can position the mag pouches on a leg rig. With the advent and popularity of tactical gear like plate carriers and war belts with the tactical crowd, it’d be foolish not to include mounted mag pouches. When wearing body armor it can be difficult to reach your belt, and sometimes the carrier’s overhang can stop you from drawing the magazine. So mounting gear on your plate carrier or other tactical vest is best done through MOLLE/PALS webbing. These holsters are almost entirely nylon, Cordura, or Ultracomp, although Kydex options exist. The Crossbreed Hybrid series is an IWB holster that utilizes both polymer and leather to create a very comfortable option for everyday carry of a spare magazine. This model is exceptionally comfortable if you want to carry one of the compact Glocks and a spare mag. Crossbreed makes excellent gear and makes it too last. So our first suggestion is the High-Speed Gear Taco MOLLE mag pouches. High-Speed gear makes excellent tactical gear, at a premium price. Their gear uses tension to retain the magazines and these mag pouches were extremely popular with the Marines I served with. They are tough, easy to use, and perfectly suited for Glock mags. Taco magazine holders are also offered in almost all configurations, colors, and mounting systems. A great belt mounted option for tactical shooters would be the Safariland Triple Magazine Pouch. These sit the magazines three in a row and are designed for medium framed Glocks. This a leather pouch system and perfect for the tactical shooter who needs a little oomph when it comes to ammo capacity. Blade Tech is one of my favorite companies for just about everything, and they produce some extremely high-quality magazine holder options. The Blade Tech Revolution Dual Mag Holder gives you enough room between magazines to easily grip and remove the magazine. This Kydex option uses passive retention and comes with Blade Tech’s Tek Lok mounting system. Blade Tech is well known and respected in the competition circle. If you like their pistol mag pouch they make great rifle mag pouches too. Also, Glock makes a series of very simple magazine pouches called the Glock Sports line if you are on a budget, they work pretty well, to be honest. Especially for 10 bucks. Holster based Glock Mag Holders are out there, and growing in popularity. The CAS IWB system allows you to carry your Glock automatic pistol and a spare mag in an IWB holster. Designed to be appendix carried and presents the magazine at an easy angle for your non-dominant hand to retrieve it and reload. This simple Kydex system disappears under your normal everyday clothes and makes it simple to carry both a gun and a spare mag. The ability to carry spare ammunition can be quite important for shooters in different roles. Having multiple options allows you to tailor the way you carry spare ammo to the way you shoot and live. What about you guys? Do you carry an extra mag or two? If so, why and how? Let us hear about it in the comments below. Looking for more of our favorite guns and gear? Check out Editor’s Picks. I vary the pistol and caliber depending on location, environment and conditions. 1 mag inserted and minimum of 3 additional on person. Same with wheel guns ( yep, old school) only with speed strips or loaders. Extra when dealing with the 10 rd limit in the evil empire ( Ca). A couple of suggestions to consider. 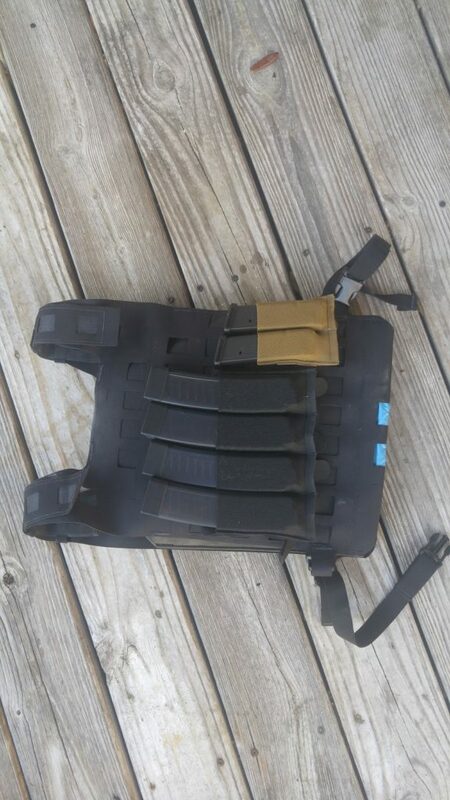 Recover Tactical has a Glock magazine baseplate with a clip that you can check out. I haven’t tried them so can’t offer any info. I use a Remora single mag holder for pocket/iwb that works well for me.